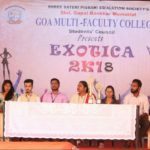 SSPES‘s, Shri Gopal Gaonkar Memorial Goa Multi-Faculty College (GMFC), Dharbandora Goa is passionate dream-come-true of the MLA of Sanvordem, Shri Ganeshbhau Gaonkar a graduate in Sociology, a visionary institution builder and an able first generation, self-made entrepreneur. 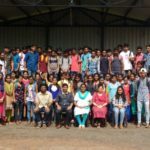 The Goa Multi-Faculty College envisages SSPES‘s great vision of Sustainable Development through Education, by aiming to empower under-privileged children born in rural and remote areas by providing them the opportunity of modern education for their sustainable and holistic development. 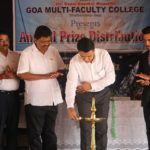 SSPES‘s Goa Multi-Faculty College temporarily operates from the fully and extraordinarily renovated premises of Government Middle School, Nr. Sanjeevani Sakhar Karkhana, Dayandnagar, Dharbandora- Goa. The construction of new and ultra-modern premises will commence soon. SSPES, Goa is a democratic society duly registered under Society‘s Registration Act (21 of 1860) on 4th October 2012 with Regn No: 662/Goa/2012 with 18 promoters. The society comprises of young, educated and enterprising people with dynamic profile, active in social and political movements comprising of Statesmen, business-men, educationists and administrators. The society is led by the Hon. MLA of Sanvordem constituency Shri. Ganeshbhau Gaonkar, Prof. Jitendra Naik, Prof. Arun Bicholkar (HSS teachers for over 2 decades) among others.